The “Groups” brochure is traditionally produced a few months before it’s “Official Holiday Guide” cousin, since the market it is created for generally needs more time to book and plan their visit. The seasonal editions are far thinner than the public brochure and don’t always give exact pricing details (these are featured in a separate supplement), but instead give information and photos to sell the resort’s general experience. With the 15th Anniversary brochure, then, can you guess what they’re trying to sell? First impressions are extraordinary – a stunning, shiny “15” with all the characters bursting out of it grabs your attention immediately. It looks whimsical, fun and very special. If the public brochure uses a design like this, we can be sure they’ll be flying off travel agents’ shelves. The brilliant design continues to the next double spread, for the 15th Anniversary itself. 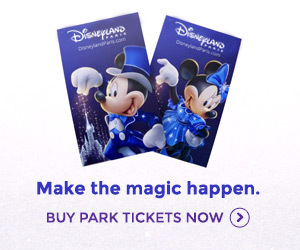 They’ve separated Disneyland Park and Walt Disney Studios very well, giving each their own page with the biggest new feature getting a large image in the centre. It’s not too crowded, uses lots of good images and features all the events in good bullet point sections at the bottom. Some of the “nouveau” fonts are a little strange, but the excellence of the rest of the design makes up for this. Finally, we have a Seasons & Events page and a “Why to book with Disneyland Resort Paris now” page. The Seasons & Events page is simple enough, with the usual information and even the actual dates for 2007’s seasons, which before now had not been confirmed. Halloween: 6th October to 4th November 2007, Christmas: 10th November 2007 to 6th January 2008. The “Why book now” page, on the other hand, is a far stronger “sell” than we usually see from the resort. Obviously concerned that in 2007 they need lots of bookings “or else”, they’ve taken to bullet-pointing reasons why 2007 is the year to visit. It recaps all the 15th events, ticket offers, Extra Magic Hours, and on so on to build up a very good case for booking with the resort. It’s unlikely we’ll see something this strong in the public brochure, but for a Groups brochure is works very well, especially when surrounded by more nice characters from the official visuals. If this is the quality of an 8-page groups brochure, imagine the quality of the final Official Holiday Guide! This really could be a year of total turnaround for the resort. You can see the brochure in Disney’s e-brochure format here, or download it as a PDF here.